One of our regular contributors recently headed back to Conrad’s Rangali Island resort in The Maldives. This was the same trip on which he was downgraded on his Amex 2-4-1 booking, but that is a story for another day! We don’t normally accept hotel reviews from readers but, as this is such an amazing Hilton Honors redemption, and as we are unlikely to make it down there ourselves, we are happy to share this with you. It such a huge article that we are splitting it over four parts. Part 2 is also published today. Parts 3 and 4 will follow tomorrow. The original version of this report, which includes some additional photos, is here. “In February 2017, I returned to one of the Hilton group’s flagship properties, the excellent Conrad Maldives Rangali Island. As an aspirational redemption opportunity, it’s a destination that I know is high on the wish lists of many long term Hilton Honors members. In response to reader requests on HfP I volunteered to write a follow up article, covering anything of interest since my first visit in February 2015. I’ll get this long-haul effort out of the way first! British Airways (BA) has direct 10 hour overnight flights from London Gatwick (seasonal Oct-Mar). We’d never experienced flying in a business class flat bed seat to the Maldives, so we decided to plan ahead and make this trip extra special. I booked a pair of Club World tickets as soon as they became available a year in advance. A lack of genuine concern for the issues we encountered. 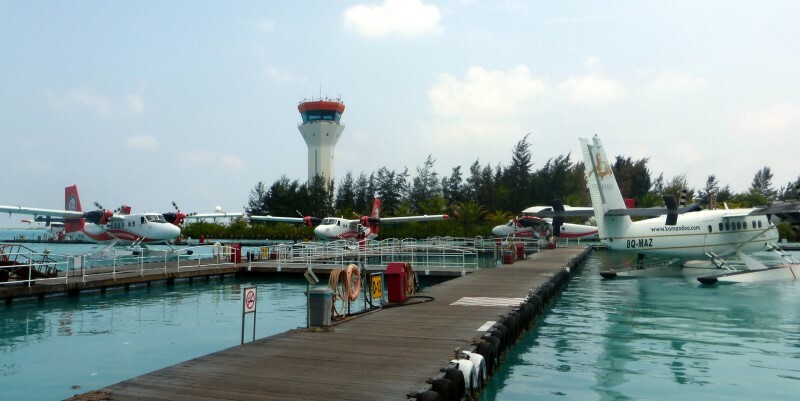 After enjoying superb views of the islands on approach, we noticed Malé Airport (MLE) is currently being redeveloped. It’s undergoing a huge construction project to build a new runway and terminal building, which looks likely to continue for a few years. We also noticed a bridge being constructed across to the neighbouring main island of Malé. Upon disembarkation, we immediately felt the intensity of the sun and the warmth of the Maldives. This was particularly welcomed after leaving a snowy UK the day before. After passport control, we waited for 30 minutes at the baggage carousel, collecting only one of our two bags in the end and then had to spend another 20 minutes filling in a missing bag report. The local staff at the baggage desk kindly phoned the Conrad to let their Airport representative know why we hadn’t appeared off the BA flight. Once through customs we met the friendly and helpful Conrad representative (Azu) and checked in our luggage for the Seaplane. The weight restrictions of 25kgs each still apply, so remember to pack light. We were then introduced to our dedicated helpful driver and his air conditioned Conrad minivan. He drove us to the Seaplane Terminal on the other side of the airport and carried our bags into the lounge. The welcoming staff at the Conrad lounge lightened our mood and helped us forget about the unnecessary inconvenience we’d encountered on the journey out. We started to really look forward to experiencing a level of service that is truly World Class. The lounge is located upstairs at the Seaplane terminal, it’s a really good improvement on the lounge we used on our last trip which was a temporary installation on the ground floor. The lounge has a good selection of soft drinks, light snacks, sandwiches, salad bar, fruit, cakes and biscuits, etc. It also has a day spa, showers and a changing area. The relaxation loungers are great to enjoy the view of the lagoon runway/seaway and catch up on communications using the fast complimentary WiFi. The Neck & Shoulder massage is still complimentary, but sadly as we had been wasting too much time waiting for our missing bag, neither of us had time to take advantage before our Seaplane departure to the Conrad Rangali. Ironically, 2 weeks later our BA flight home was delayed, so we enjoyed the Conrad Seaplane lounge facilities for a couple of hours. This allowed plenty of time for massages, a shower and a change of clothes. 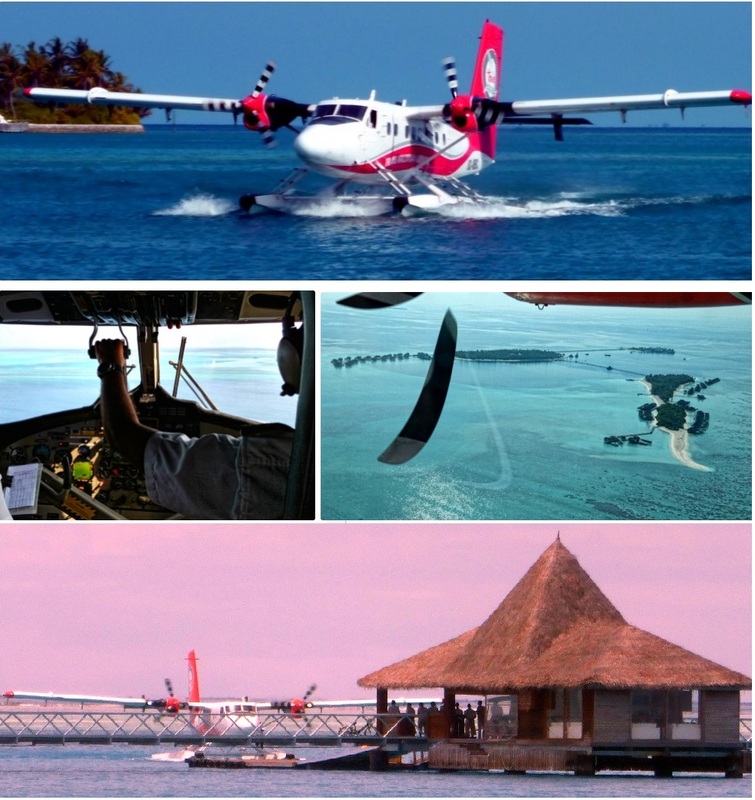 Seaplane returns are still $560 each (inclusive of tax). This fee is payable on departure from the Conrad at the end of your stay. Although I’ve flown in a Seaplane a few times before, for an aviation fan it’s still great sitting in the front row, looking through the cockpit seeing the barefoot pilots fly the plane. Sharing their experience of the flight and taking in the views of the surrounding islands adds that bit of excitement to your journey. 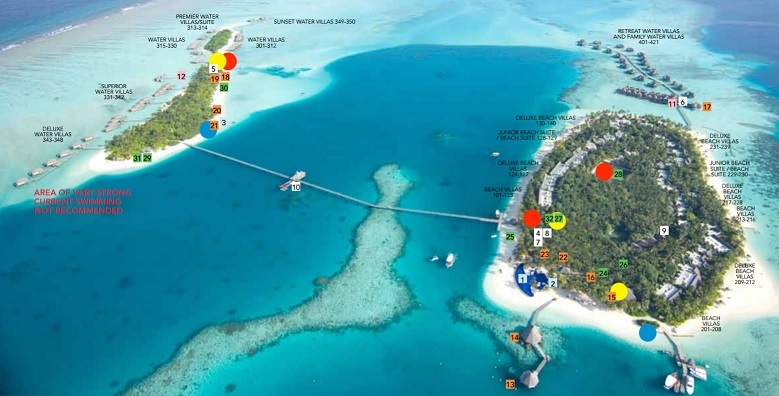 The map above shows the Rangali islands joined by a bridge where the Seaplane pontoon is located. 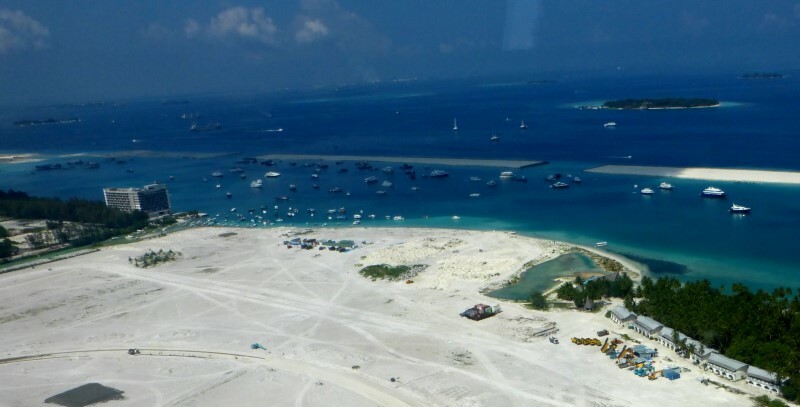 The island on the left is the smaller island of Rangali (with Vilu) and the main island Rangalifinolhu (with Atoll) is on the right with the Retreat Water Villas, top right. Bobby (Director of Operations) and Alex (Director of Guest Services) greeted us by name as we got off the Seaplane, asked about our journey and assisted other staff members in lifting our luggage up the arrival ramp at the Seaplane pontoon. Whilst I thought this was a really nice gesture, it was not out of the ordinary. During my stay I witnessed them assist many other guests with their luggage and give the same excellent service. Our resort host Anees (same as 2 years ago) greeted us and got us a refreshing sorbet, bottles of water and cool face towels. We then walked with Anees across the bridge to the main reception on Rangalifinolhu island to check in for our stay. discuss and organise upgrades for our stay. Our first upgrade was to a Deluxe Beach Villa on the sunrise/reef side of Rangalifinolhu and approximately half way through our stay we arranged to transfer to a Retreat Water Villa. If you are interested in any type of upgrade then you should contact the hotel in advance to enquire. Any special deals you are offered really depend on many factors, such as season, accommodation capacity, etc. 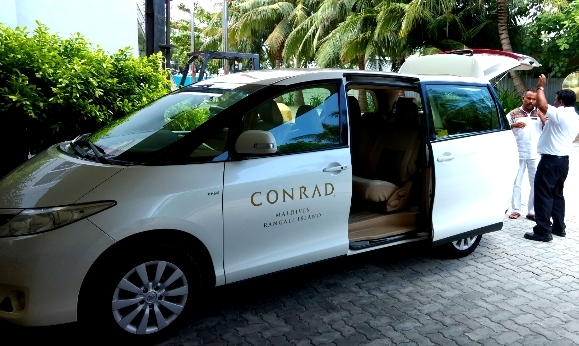 Click here for Part 2 of this Conrad Maldives Rangali Island review which focuses on the different types of accommodation available. Parts 3 and 4 will be published tomorrow. Much of your trip involved snorkelling / scuba. For someone that doesn’t like putting their head under water, would Rangali still be worth it? In all honesty that’s a tough one to answer. A few of my friends have seen the accommodation and they love it, but I haven’t recommended it for them, because unless you’re happy reading a book on the beach/villa patio/deck all day or enjoy active pursuits then the resort is limited. Not tons of nightlife (it’s not Ibiza), but that suited us perfectly. Jet Skis and glass bottom boat are available at a cost. We are booked next Jan, it’s a week of pure relaxation. @Tilly71, I agree. Looks like a nice nice place to spend 5 nights without a care in the world. Hmm…. For us personally, we don’t scuba dive so a week was just about right laying around doing nothing but relaxing in the sun. Remember it’s a small island so yes some comments are correct there isnt masses to do, there are some very nice looking boat excursions, big game fishing trips, private island for a day picnic trip if your prepared to pay big money. (Ouch)! The following link on activities might be of interest to Genghis too. The kids club is ok for smaller children, we were there this time last year for 12 nights and our 2, aged 8 & 10, got a little bit bored. The staff were fantastic in the kids club but our children were used to a much busier, and bigger, kids clubs with more tech stuff to use ( for better or worse). It is a stunning place and considering, where it is, it is amazing what they have created in the middle of nowhere. But the effort to get there and, for us, the lack of activities for the children means we probably won’t return. 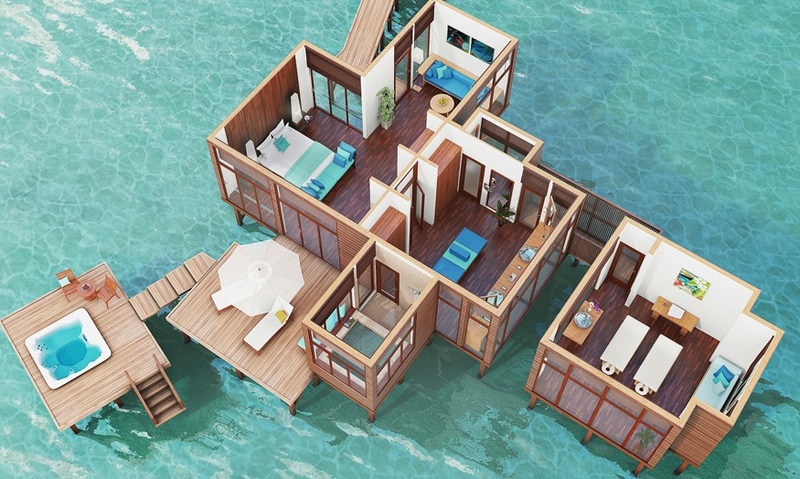 We spent 10 nights in a retreat water villa( 415) which was definitely worth the extra money .. Thank you for the review, very helpful! 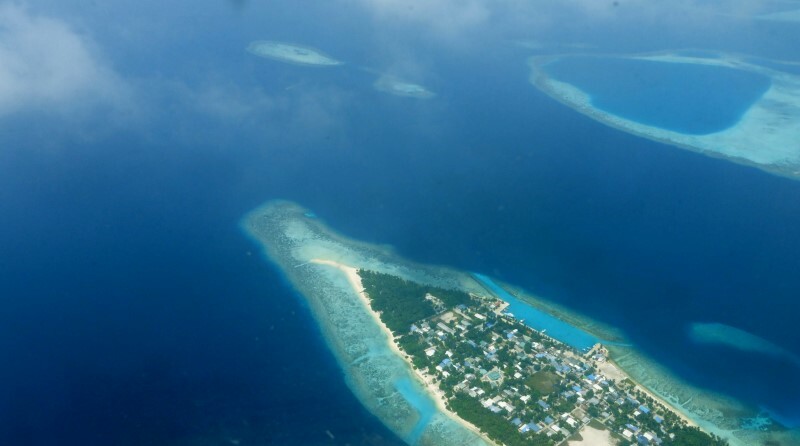 We have a trip to the Maldives booked and had been debating whether we would go with the Hilton as we have status and points, your review has swung the balance. Loved the review Anon. Couldn’t wait for parts 3 and 4 tomorrow so went over to your site. Looks fantastic. Definitely an aspirational redemption, now just to collect another 600,000 HH points. Nice review, Anon. Saw your link to your CW experience – looked like CEDR/dowgrade compensation discussed in the past tense, does that mean all settled now? Nope expected to take a few more weeks yet. CAA say under EU261/2004 75% should be automatically be paid to pax within 7 days of downgrade, I’m expecting it’ll take greater than 7 weeks…. I’m no expert, but would this give you a reason to add statutory interest to your claim? Interesting that BA, CEDR and EU261/2004 are featured by LL today..
Ah OK – good luck and look forward to hearing the outcome – hopefully the 75% is of a good amount! It’s worth noting that while it is an expensive redemption points wise, you do also get a lot back because of the spend to your room (sea plane, ++ taxes, food etc.). We did 7 days there as a couple and spent $5000 which included an upgrade to an over water villa for part of the stay and some spa treatments. I seem to recall that we earned, due to promotions and status, over 250,000 points. Good value for money? I think it’s excellent. Late breakfast ment that we never required lunch and free drinks always got our evenings off to a pleasent start. I’ll be back there 2019 for our 15th wedding anniversary. I wont be flying BA! Can I ask how you managed to get 250k points back in promotions? My account history doesn’t go back that far (Nov 2015) but I think mine was also closer to 400,000 but I put 250,000+ just to be safe. If I recall correctly, there was a promotion for 2x, 3x and 4x at the time based on previous stays and I did a couple of cheap mattress runs to get a higher multiple for my Maldives stay. That’s 130,000 and then a Diamond Bonus at 50% would take you to 195,000. This is off the back of an envelope and with little research so others might be able to pick holes, but it hopefully illustrates that based points do add up on big stays. Our US snorkel buddies intend going back for early 2019, they kept having fun laughing with me when I said not sure exactly when we’ll next be back again. He travels a lot on business so no real probs for him getting the points. We’d met them out there at Happy Hour on our first trip in 2015 and kept in touch and so arranged for our trips to overlap for this visit. Meant to put in my review, that I rate Vilu as the best Hilton Executive Lounge in the world! Everyone is so friendly & happy to chat. With regards to the cost of the seaplane ($560) – is there any age limit at which you don’t pay or concessions for children? I would be looking at going with a 14 month old and a 3 year old. TripRep, sorry if I missed it somewhere – has a final decision been made about the value of a 2 4 1 voucher in your circumstances? Posted this above, it’s now in the hands of the expert bods at CEDR, they need the time to examine and make a fair assessment. I’ve thought of an interesting learning point for those yet to use their 241 vouchers on future flights…. I’ve just discovered it is perfectly possible to get a BA flight quote emailed to you of what it would cost you to buy a return cash ticket for one pax. So if you do this on the same day that you pay for your flights with the companion voucher + Avios you now have an approxiamte record of what BA values in £ GBP for a companion vouchers buying power for your flight. Not totally sure what MCOL would say about the legals, but at the very least it might be a useful trick to do and file away for those concerned and a reminder to BA (and Amex) that the companion voucher does have value! For the remainder of this year I suspect whilst AMEX may see a decrease in applications, CEDR may see an increase in claims! I think that’s a very reasonable approach and certainly additional data in support. That function has also been useful in the past when an employer, etc. is only willing to pay for an economy flight – assuming they are happy you can then use that price quote (combined with your actual booking receipt) to claim for the cost of an economy flight from your UK departure point whilst you end up instead booking ex-EU and often paying a similar or only slightly higher amount!